This boy doll is named Wishing You the Luck o' the Irish. This Irish boy doll features a shamrock nose along with a shamrock decorated shirt and pants. 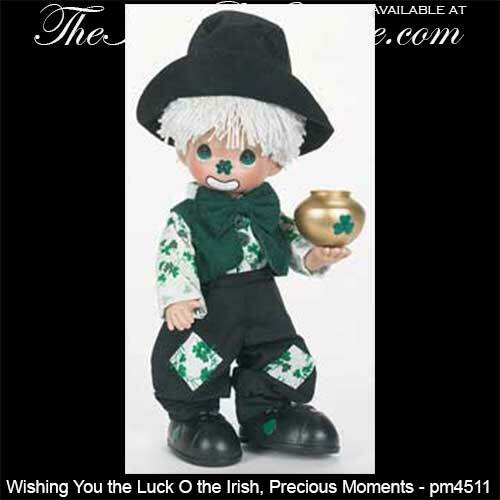 The Irish doll has white hair and he is holding a gold pot with a shamrock. The doll, from Precious Moments, is made of cloth and plastic and stands 12" tall. The boy also has jointed limbs and is gift boxed with a shamrock history card that is complements of The Irish Gift House.